The Nexus 6 is Google’s first foray into the large smartphone space that has been dominated by Samsung. The Galaxy Note series, on the other hand, has grown from a niche product, to what many might consider Samsung’s true flagship with its latest offering, the Galaxy Note 4. While a comparison between the latest and greatest from both those companies are always interesting, this is the first time that things are on a more even playing field, and we are certainly excited to pit them against each other. 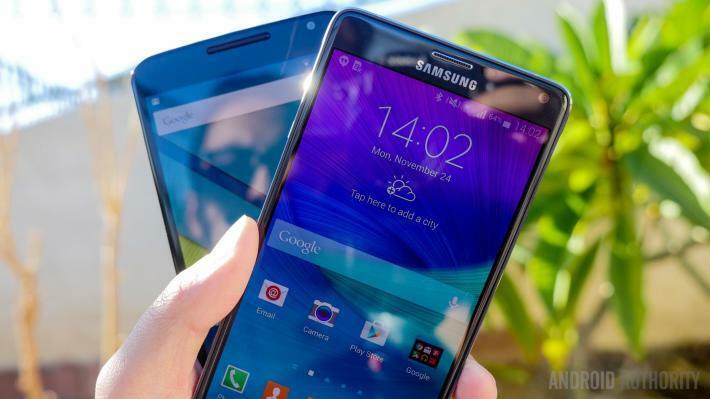 Here is an in-depth look at the Nexus 6 vs Samsung Galaxy Note 4! Editor’s Note – If you haven’t had a chance to see our thorough videos and comprehensive written reviews, see them here! Both were awarded our Editor’s Choice for a good reason! Before diving into specific aspects of the design language, the obviously noticeable similarity between both devices is the size. While this is something we expect from Samsung and the Note series, the significant jump can take a little getting used to for all the Nexus fans out there. The size isn’t the only similar factor, but overall, the more rigid lines of the Galaxy Note 4 go up against the curved design language of the Motorola-manufactured Nexus 6. The Samsung Galaxy Note 4 features a new metallic frame, a design element that was first introduced with the Galaxy Alpha, that holds together the 2.5D curved glass up front and the removable back cover, that is once again made from a textured plastic. Samsung’s signature button layout returns, with a physical home button, flanked by capacitive back and recent apps keys, found below the display, along with the volume rocker and power button on the sides. As always, you’ll find the S-Pen tucked away into a slot at the bottom right, easily accessible for when you may need it. The Nexus 6 also comes with a metal frame and the 2.5D glass up front, with a back cover made from a hard plastic material and with a noticeable curve to it. With its slightly larger display, the Nexus 6 is a little bigger than the Galaxy Note 4 all around, completely encompassing the latter when placed on top of it. Two front-facing speaker grills are found above and below the 5.96-inch display of the Nexus 6. Size is certainly a contributing factor to the handling experience, but the choice of build materials and design language play a big role as well. The flat sides and the textured back cover of the Galaxy Note 4 help keep the grip pretty secure, while with the Nexus 6, the hard plastic back and the curved sides make for a somewhat slippery experience, which is never a good thing, especially with a device of this size. If you’re moving to either of these devices from a much smaller one, it will take some time to get used to, but the learning curve will likely be steeper with the Google flagship. Aesthetically, there’s not much to complain about with either smartphone. While the design language remains similar to previous flagships, the new material choices used with the Galaxy Note 4 add a certain amount of flair to the device. On the other hand, Google has banked on Motorola’s tried and test design from their own flagship, the Moto X (2014), only in a larger form factor, making for one of the best-designed Nexus devices yet. Quad HD is the weapon of choice in the current display spec war, and while there might not be a notable difference from 1080p, we certainly aren’t complaining about the change. Both displays also come with AMOLED technology, with Samsung once again employing their tried and true Super AMOLED displays, to bring the high saturation and contrast you may come to expect from Samsung flagships. AMOLED is utilized by the Nexus 6 in a similar fashion, as its colors have some of that saturation and very comparable sharpness, though its main advantage is the activation of only a pixels for the Ambient Display. Either screen allows for a fantastic viewing experience, with the Nexus 6 losing a little fidelity only at the sharpest of viewing angles. Though the display of the Nexus 6 is slightly larger, the overall media and gaming experience is largely the same, and basically amazing, on both. It is worth noting that if the high saturation of the Galaxy Note 4 display isn’t your thing, you do have the ability to adjust the color profile to your liking, something not possible with the Nexus 6, which also likely won’t require it. Bottom line, both displays represent the pinnacle of current display technology, and you cant go wrong with either choice. With both smartphones featuring identical processing packages with the quad-core Qualcomm Snapdragon 805 processor, clocked at 2.7 GHz, and backed by the Adreno 420 GPU and 3 GB of RAM, performance essentially comes down to their respective software implementations. As the best processor currently available, everything runs as smoothly as you’d expect. Which is to say, incredibly smooth. With the Galaxy Note 4, you get the more colorful and brighter TouchWiz, with its slew of multitasking capabilities that lets you get a lot done, sometimes all at once. On the other hand, Android 5.0 Lollipop on the Nexus 6 brings its own set of flowing animations and transitions, that will be very pleasing to the Android purist. Either way, the performance of both devices has everything to do with which software experience you prefer, as things remain the same with regards to the processing package. It’s in hardware that some real separation starts to show between the two devices. Apart from the usual suspects of a replaceable vs non-removable battery, and the lack of microSD expansion with the Nexus 6, the more significant difference lies in the inclusion of the S-Pen stylus with the Galaxy Note 4. When removed from its slot, the S-Pen opens up the Air Command menu with its various options, including using S-Note for recording notes in a variety of ways, clip out a part of the screen that you want to save, to just write some text down for contextual actions. Even if you don’t use the S-Pen much normally, the click and drag enhancement introduced with the Galaxy Note 4 is actually one of the most compelling reasons to start. As mentioned, the Nexus 6 keeps things pretty bare bones with regards to additional hardware. What it does excel in is the audio experience, with the dual front-facing speakers doing a much finer job than the rear-facing speaker of its Samsung competitor. When it comes to the battery though, it is difficult to recommend the Nexus 6 over the Galaxy Note 4, as the standby power consumption of the former isn’t nearly as frugal as the latter. Both devices are capable of offering close to 5 hours of screen-on time, but I haven’t been able to get close to two full days of use with the Nexus 6. Despite the better longevity of the Galaxy Note 4 battery, the good news is that both benefit from fast charging capabilities. When it comes to the camera, the big story is of course the improvement in the Nexus 6 camera experience, making it the best Nexus camera around. That said, Samsung’s camera prowess is well known, and the Galaxy Note 4 features one of the best in the business. Read & Watch – Nexus 6 Camera Shootout! Starting with the Nexus 6, its 13 MP rear shooter now provides better colors, very decent detail, along with the simplicity of the camera application that helps make shooting very easy. HDR+ is a good performer here, doing the job properly in brightening shadows, darkening highlights, and providing the compelling image it should. Panorama and Photo Sphere aren’t very commonly used, but are available here, along with 4K video recording capabilities. As you’d expect from a Samsung device, the camera application of the Galaxy Note 4 is packed with features, resulting in quite a daunting list of toggles when you enter the Settings menu. HDR is available here as well, even if it doesn’t offer as profound an effect as you get with the Nexus 6. General photo quality is still fantastic, and the higher saturation levels during processing will please the general user. The 16 MP shooter also captures plenty of detail. Video recording also benefits from the coloration. As expected, the quality tapers off as lighting conditions worsen, but optical image stabilization, that is available with both smartphones, does help a bit in this regard. Despite the higher saturation levels of the pictures taken with the Galaxy Note 4, people will still have a more reliable time with the Samsung camera. The Nexus 6 misses the mark a bit more, but it cannot be emphasized enough how much of an improvement this is for the Nexus line. Finally, when it comes to software, we return to the age old debate of stock Android vs TouchWiz. Though the Galaxy Note 4 will be updated to Android 5.0 Lollipop quite soon, the comparison still works for now, as TouchWiz adds so much to the stock experience that is found on the Nexus 6. A dedicated homescreen experience is available with both devices. It should come as no surprise though that Google Now is a much better alternative to the highly curated, non-customizable, full screen widget for Flipboard on the Galaxy Note 4. That said, Touchwiz has gone through a number of changes recently, bringing a more refined design and better access to multitasking abilities. The Recent Apps screen is one of the main areas of change, where a multi-window button has been added to easily create the dual application setup. Floating windows have been added to the mix, and the ability to seamlessly switch between all these modes further helps those looking to get many tasks done. For example, when in an app, dragging from a top corner will shrink it down to a floating window, which includes buttons to expand it again or create a minimized icon for later use. Multitasking is definitely a big reason to pick the Galaxy Note 4, as the Recent Apps screen is still the main way that users perform tasks in stock Android. Though this screen has been enhanced to include Chrome tabs in its stacked card design, the list can get quite enormous, and switching between apps, though still quick and easy, just doesn’t hold a candle to the ability to use two or more at once. What stock Android 5.0 Lollipop brings to the table is an overhauled version of Android, providing an attractive, flat design. The animations and transitions make for a very seamless feel, and for any Android purist, this is simply the best that the interface has ever been. It ultimately comes down to how many features you think you will need. In stock Android, the Recent Apps screen might be overwhelming, but so is navigating through the numerous multitasking options available with the Galaxy Note 4. If you need to do many things at once, the Samsung flagship is the device for you. On the other hand, if you prefer a more minimalistic approach, stock Android 5.0 Lollipop is one of the smoothest, and most beautiful, iterations of Android yet. What has been a little disconcerting to users wanting the Nexus 6 is how much more expensive it is from previous Nexus releases, which does make sense when you factor in how much Google and Motorola have packed into this powerful device. After all, the Galaxy Note 4, priced at over $700, is still more expensive, even if the Nexus device isn’t far off with its price point of $649. Both of these smartphones are available from various network carriers in the US under subsidies and payment plans, however, so the entry points actually aren’t far from one another. There you have it – a closer look at the Nexus 6 vs Samsung Galaxy Note 4! Both of these devices have received our Editor’s Choice Award, and deservedly so, with both offering the best their respective lines have to offer. When pitting one against the other however, the choice isn’t as simple. Fundamentally, both devices provide power in large form factors, capable of making everything underneath run smoothly, and what it comes down to is how you want to perform general tasks. The Galaxy Note 4 tries very hard to be everything to the user, providing multitasking abilities atop a one of a kind stylus experience. You can certainly do all of your tasks on the Nexus 6, but its methods are vastly different, despite getting the all around upgrade that any Android purist will enjoy. Unless you don’t want a big phone, you’re looking at the two phones that arguably offer the most, for the most people. In either case, you’ll get a powerful, highly capable phone that won’t disappoint. Let us know which one reigns supreme in your book below!